Special education teachers work with students who have special needs such as: learning difficulties, speech and language impairments and other communication difficulties, emotional disturbances, behavioral disorders, physical disabilities, and developmental disorders. But as well as working with students who are learning disabled or developmentally challenged, they might also assist students who are gifted and talented, to help them acquire education and life skills. In order to do this, they need to create a learning environment to meet the unique needs of each student. Special education programs provide an excellent means to obtain the requisite knowledge and skills, and to qualify for this rewarding career. Many students who take this specialization are already licensed teachers and are seeking a license in special education teaching. The programs can be taken at bachelors, masters and doctoral levels. The fact that these programs are readily available online makes them accessible without leaving employment. This page provides information about special education programs online and on campus, and how they can prepare you for a most rewarding career working with students with special needs. It provides more detail about the programs and where you can take them. What do you study in special education programs online? An online special education program provides the educational foundations, curriculum development, teaching methodologies and classroom management strategies that the special education teacher requires to help students with special needs to learn. 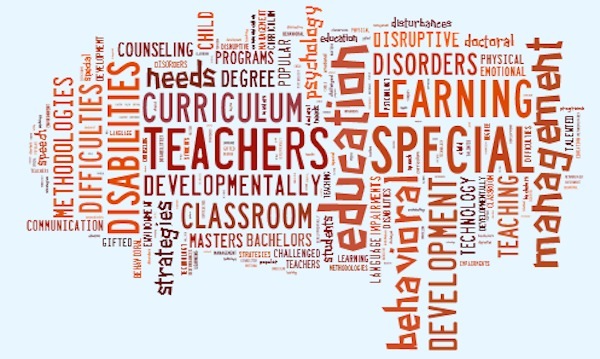 Thus, special education degree programs would typically include: educational psychology; child development; adapting the curriculum; management of disruptive behavior; use of technology in the classroom; dealing disabilities; discipline; behavioral management; counseling. Special education masters online programs are popular with graduates who already have a bachelor’s degree in another field, or those who are already licensed teachers, and now wish to become special education teachers. Graduate special education programs are also popular with special education teachers who wish to specialize in a particular aspect of special education. Doctoral level programs in particular, present an opportunity for in-depth study of a topic of interest. What are the career prospects after graduation? The minimum qualification for a special education teaching job is a bachelor’s degree in special education, but a masters is preferred. In order to teach in a college of a university, you need to have a masters degree or more preferably a PhD. As well as teaching in the government education sector, graduates also find employment in: training; teaching in the private sector; community services; and, in administration. Online education programs also provide a base for further training in counseling and careers work. Graduates also find work in development jobs and other non-profit organizations.